This is the only zinc-roofed timber-built shop along the main road of Rantau. How long it will be here, I do not know. and that is whyI chose to record this in my visual journal. CONTRARY to what I thought, the name Rantau, a small town not far from Seremban, in Negri Sembilan, did not come from the Malay word rantau (to travel). Instead, I was told it was derived from the name of a village called Kampung Orang Rantau Panjang Kelang. The village was believed to have been set up by Bugis immigrants who fled the civil unrest in Rantau Panjang in Klang during the mid-1800s and what began as Kampung Orang Rantau Panjang Kelang, had over the years lost its mouthful of a name. Today, it is known simply as Rantau. 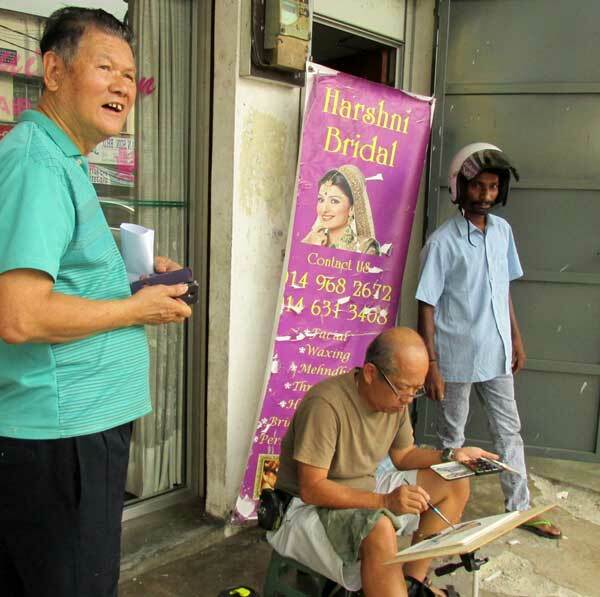 The main bustling area in this sleepy hollow is along the main road, Jalan Besar, which is also part of the trunk road linking Seremban, off the expressway, to Linggi and other smaller towns. With a population of 9,000, Rantau was once surrounded by rubber and oil palm plantations but these have made way for housing estates. I painted this house because it appeared to be the only zinc-roofed timber building that had withstood the ravages of time and development. Known simply as 38 Jalan Besar, it is the premises of Tamilan Store, a small Indian sundry shop. It is two doors away from Sri Bala Thandayuthabani Temple along the main road. According to a villager who saw me painting from across the street, a huge fire decades ago razed the upper reaches of Rantau town. I chose to paint this small town. In the morning until late afternoon, the hawker centre on the main road is a hive of activity, Villagers gather here for a meal and to chat with each other. By evening, there is not much activity. Although the town itself does not have much to offer tourists except a chance to stretch their legs and have a drink, there are several back-to-nature holidays in the Rantau district. They include Rantau Ecopark in Kuala Sawah and Rantau Agro Park in Kampung Seri Lalang. Anglers may want to check out Kampungstay Haji Sulaiman in Kuala Sawah which offers not only accommodation but also a chance to hook up a whopper at its freshwater lake. Rantau has produced a few prominent Malaysians such as Maha Sinnathamby, the man behind Greater Springfield, Australia’s largest master-planned development, and the former soccer great, the late Ghani Minhat. This piece was done on a larger sheet, an A3, when I ran out of pages on my sketchpad. Kellie's Castle, also known as Kellie's Folly, is an incomplete castle located in the Batu Gajah district in Perak. This unfinished mansion, now a ruins, was built by a Scottish planter named William Kellie Smith. It was believed to be a gift for his wife, built beside the Sungai Raya, a tributary of the Kinta River. Some people say that it was for Kelly's son, however. 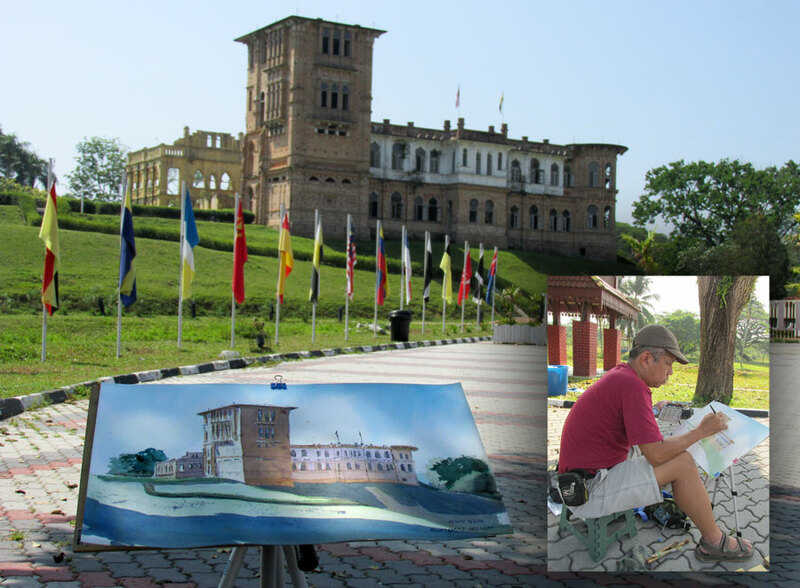 Today, this tourist attract has received another refurbishment in preparation for the Visit Perak Year 2017. 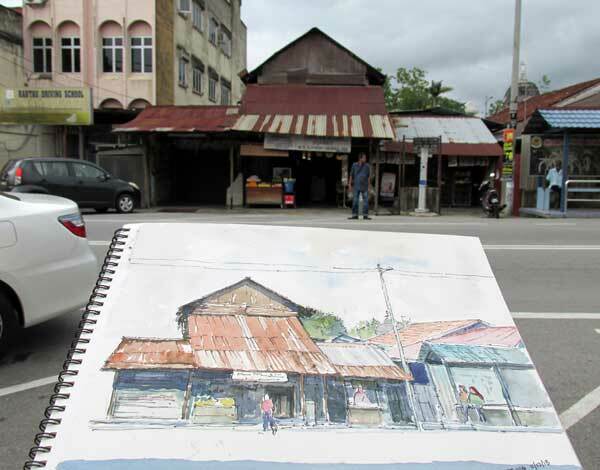 This sketch was made during my recent walkabout up north the state of Perak. One of the two mine entrances that lead into the tunnels but they have both been closed. BATU ARANG, about 50km north of Kuala Lumpur, derived its name from the Malay word for coal, which is arang batu. After coal was discovered here in the early 1900s, British coal miner John Archibald Russell set up Malayan Collieries Ltd (MCL) to start mining operations in 1913. Five thousand miners were employed and they worked around the clock in three shifts to meet the high demand for coal in the region. At the height of its prosperity in the 1930s, Batu Arang was believed to bethe most developed town in Selangor and locals even nicknamed it Mini Gold Hill. It had even its own airstrip which allowed salaries of miners to be air-dropped into the town. The Federated Malay States Railways (FMSR) built a railway line to connect Batu Arang to Kuang and within the coal mining township, MCL built its own network of tracks linking the various gantry points of the open cast mines and other subsidiary industries, including its own brick factory. The decline in demand for coal began in the 1950s when industries and the railways switched to using diesel. The coal mining era in Batu Arang ended in 1960. In the span of 47 years, 15 million tonnes of coal were believed to have been mined from the deep earth and open cast mines. Today, all the entrances to the deep earth mines have been sealed. The open cast mines, located on the hillock behind the police station, are filled with water and turned into a huge lake. Access to the lake has also been fenced up but a worker manning the gates allowed me to enter to take pictures. He claimed that the lake was very popular with anglers. 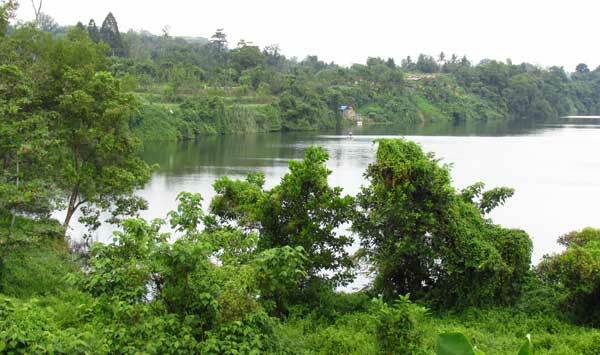 At its deepest point, the lake is at least 200m deep, he said. He showed me bits of coal still embedded in the ground. At a coffeeshop near the market in town, I asked some old men why Batu Arang had no high-rise buildings. One of them explained that there was a huge network of mining tunnels running underneath the township. Many of these tunnels had collapsed and damaged the buildings on ground level, so for that reason, building highrises which required heavy piling had been prohibited. On March 15, 1992, the New Sunday Times carried a feature on the dangers that Batu Arang townfolk faced from sinkholes that had appeared over the years due to the collapse of subterranean mining tunnels. This painting is of one of the entries to the deep earth mines. This tourist attraction is a few hundred metres from the SKJC Chap Khuan, along a laterite path. There is a signboard that marks its location but you have to walk down a 100m path to get to the entrance which is almost swallowed by undergrowth. 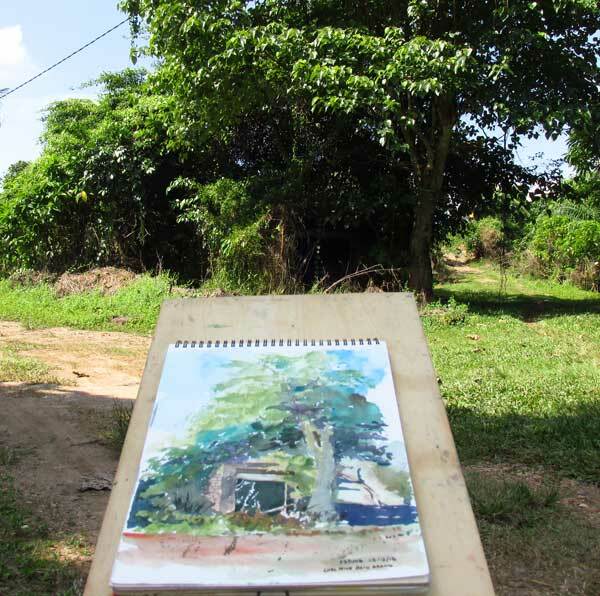 While painting this scene, I had to fend off not only mosquitoes but also some suspicious looking characters who had gone into the bushes in front of me. I later found out that these were drug addicts getting their daily fix. Visitors should also watch out for snakes. Batu Arang was declared a Heritage Town by the State government some years back and today, remnants of its colourful past include a coal miners' settlement comprising dilapidated brick houses, a row of two-storey shophouses believed to be built in the late 1920s, the police station grounds (which once housed the Gurkha forces barracks and were the premises of the Malayan Collieries Ltd), and an abandoned brick kiln.